Since the publication of the 2005 Human Security Report, scholars and policy-makers have debated the causes, interpretation and implications of what the report described as a global decline in armed conflict since the end of the Cold War. 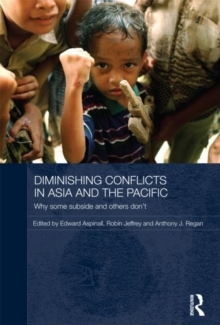 Focusing on the Asia-Pacific region, this book analyses the causes and patterns of this decline. In few regions has the apparent decline in conflict been as dramatic as in the Asia-Pacific, with annual recorded battle deaths falling in the range of 50 to 75 percent between 1994 and 2004. Drawing on a wide range of case studies, this book looks at internal conflicts based on the mobilization of ethnic and nationalist grievances, which have been the most costly in human lives over the last decade. The book identifies structures, norms, practices and techniques that have either fuelled or moderated conflicts. As such, it is an essential read for students and scholars of international relations, peace and conflict studies and Asian studies.